David Knieriem - SaaS Enterprise Software Sales Executive: Leading Banks to be Competitive, Compliant & Profitable. CLEVELAND—On a rainy morning in April, Anna Proctor entered a Wal-Mart Supercenter near some of this city’s poorest areas to get $300 for urgent car repairs—money she didn’t have. Inside, she joined a line at a Woodforest National Bank branch and intentionally overdrew her account. When her paycheck was deposited 12 days later, she said, the bank would take the borrowed sum plus a $30 fee. “It’s cheaper than a payday loan,” said Ms. Proctor, a 35-year-old customer-service worker. If her overdraft and fee were calculated as a loan, the annual percentage-rate interest, or APR, would be over 300%. She said she overdraws “all the time.”Wal-Mart Stores Inc. is known as a low-cost retailer, but customers of some of the independent banks inside its outlets are among America’s highest payers of bank fees—a large chunk of which come from overdraft charges. 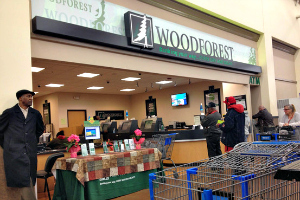 A Wall Street Journal analysis of federal filings found that the five banks with the most Wal-Mart branches, including Woodforest, ranked among the top 10 U.S. banks in fee income as a percentage of deposits in 2013. Other banks among the top 10 serve the U.S. military, as the Journal reported in a January page-one article. Most U.S. banks earn the bulk of income through lending. Among the 6,766 banks in the Journal’s examination, just 15 had fee income higher than loan income—including the five top banks operating at Wal-Mart. A spokeswoman for Wal-Mart said it has a “very thorough process” for vetting banks to which it leases store space, to ensure “they’re in line with Wal-Mart’s philosophy of saving customers money.” Wal-Mart has no role in the banks’ operations, she said. Some of the leading banks at Wal-Mart pitch accounts to people who otherwise might not have access to banks, including those with bad credit histories. Woodforest’s chief executive, Robert E. Marling Jr. , said his bank provides convenient hours, free financial education and unusually forgiving account features, often for riskier customers previously shut out of the banking system. The bank lets clients overdraw, in some cases up to $500, for a fee. via Why Banks at Wal-Mart Are Among America’s Top Fee Collectors – WSJ Article by Mark Maremont & Tom McGinity. Banks in Wal-Mart are part of the retailer’s push to provide a range of services, including financial, to the vast numbers of people coursing through the stores every day. Wal-Mart dropped its own bid for a bank charter in 2007, but it leases space to other banks. Many customers are low- to moderate-income people, who tend to pay the highest service charges. Some banks in Wal-Mart cater to customers who have had banking troubles elsewhere. Wal-Mart also offers its own financial services, often at low cost, including check cashing and a new money-transfer offering. The leading banks inside Wal-Marts make most of their money from fees, not from lending. That’s unusual. Of more than 6,700 U.S. banks the Journal examined, only 15 had more income from fees than from loan interest. All five leading banks in Wal-Marts are among those 15. Regulators in 2005 issued guidance that called overdrafts a form of credit but continued 1960s-era rules that deemed charges on them to be convenience fees—allowing overdrafts to remain outside key credit regulations. The Consumer Financial Protection Bureau has been examining bank overdraft programs since 2012 and released a study last year. Its director said overdrafts can provide consumers with needed funds, but “have the capacity to inflict serious economic harm.” Timing of any regulatory action is unclear. Overdraft programs shouldn’t be used as payday-lending substitutes, said Rebecca Borné of the Center for Responsible Lending, a consumer-advocacy group. “It’s not illegal per se, but it flies in the face of the whole regulatory regime that’s been set up to allow overdraft fees,” she said. Wal-Mart said it vets the banks inside its stores to ensure they are in line with its “philosophy of saving customers money.” It has no role in the operation of the banks, which are overseen by federal regulators. A number of customers the Journal contacted said they regularly overdraw their accounts, willingly paying the fees. “I used payday lenders before but they’re more expensive,” said Frank Owens, 38, who opened his Woodforest account in the Cleveland Wal-Mart because of “financial difficulties” at another bank. via 5 Takeaways on Banks at Wal-Mart – WSJ Article by Mark Maremont. LONDON—Last summer, Adrian Eady, a banker with Royal Bank of Scotland Group RBS, was nearly crushed hauling a crate of feta cheese off a forklift truck in a North London warehouse. A few months earlier, the state-controlled bank sent Mr. Eady to wear an apron and serve cappuccinos in a cafe. Before that, he was selling novelty greeting cards in a shop. Following a political uproar over a lack of bank lending to small businesses, 81%-government-owned RBS created its “Working With You” program. All RBS corporate bankers must spend at least two days a year working for a customer free of charge. It is an example of the extensive pains RBS is taking to try to appease its masters and customers after six years of withering criticism for everything from excessive pay for executives and top bankers to a lack of small-business lending. The new CEO, Ross McEwan, publicly agreed with U.K. Chancellor of the Exchequer George Osborne’s view that RBS must refocus on its U.K. retail and corporate market. RBS hired former Bank of England official Andrew Large, who produced a 95-page report on how it could do better at small-business lending. This week, the bank will present a new strategy aimed at cutting back office costs, slimming its global footprint and restructuring its corporate bank. Perhaps more damaging are allegations by a government adviser that the bank is failing its customers. RBS, like its peers, faces rampant complaints that it isn’t lending enough to small businesses and is hampering economic growth. The adviser, Lawrence Tomlinson, alleged to a parliamentary committee that RBS forced several small businesses into default to seize their assets for a profit. “It seems to be systematic to me,” Mr. Tomlinson said. RBS denies this allegation. Given the public debate over small-business lending, RBS is taking action to shake up its corporate bank, introducing new services and shuffling the unit’s management, according to a person close to the company. It also is trying to drum up demand for loans. The bank sent hundreds of relationship bankers, who work with specific clients, to deliver letters to small businesses offering them credit. Since 2011, RBS also sends corporate bankers to work in customers’ businesses. The aim is for bankers to see things from a customer’s perspective and better understand the businesses that they lend to. via RBS Works at Pleasing Master, Clients – WSJ Article by Max Colchester. On Thursday, luxury retailer Neiman Marcus announced that hackers had lifted the credit card information of as many as 1.1 million customers during four months in 2013. This news comes closely after Target’s announcement that up to 110 million of its customers were affected by a data breach over the holidays. These data heists underscore the need for updating the payments system to protect consumers from cybercriminals. That’s something bankers and retailers, who share the responsibility for the system’s integrity, should work together to accomplish. Retailers and bankers have been sparring for a long time over who should pay for the losses when credit- and debit-card fraud occurs. Retailers balk at paying “interchange” fees—payments to banks for covering the cost, as well as the risk, of handling card transactions—which go in part to antifraud efforts. They are also reluctant to pay for new card-reading systems that would bolster consumer safety. Banks, in turn, are left with the responsibility to make customers whole—even when the institution had no part in the fraud. The fracas between banks and retailers is a distraction from real, daily threats to the safety of the payments system. Neiman Marcus and Target appear to be victims of malware software that steals information before it ever leaves the companies. The breaches offer a timely reminder that cybercriminals are trying every day to steal customers’ data—and money. Combating this requires daily vigilance. The existing payments system is strong, functional and provides extraordinary benefits to users. Customers can make or receive a payment anywhere in the world, at any time of day or night. Even after a significant breach at a retailer, customers continue to use the electronic-payments system. No data disaster has discouraged Americans from swiping their credit and debit cards, racking up $3 trillion in charges annually. And for good reason: Customers can charge confidently because their banks protect them from losses by reissuing cards and absorbing fraud losses. Banks make restitution for fraudulent charges, even if the bank isn’t responsible for the leaked data. But banks can’t be the only backstop for fraud. Retailers must share the responsibility. It’s a bit ironic that retailers continue to oppose paying interchange fees to banks that help fund innovation, maintenance and security in the electronic payments system they rely upon every day. Sharing responsibility means that retailers should share the cost when systems are breached. For example, banks and retailers need to work together to complete the transition to a chip-based technology called EMV. Credit and debit cards traditionally use magnetic stripes, which are more easily duplicated by crooks. EMV embeds cards with a micro computer chip, making it harder to commit the same types of fraud seen with magnetic stripes. Counterfeit card fraud is down significantly in Europe with the implementation of this technology. But making the switch by 2015—as already put in motion by the major credit card companies—requires merchants and others to significantly upgrade their own card-reading equipment. These costs are not insignificant, which has generated resistance from some segments of the retailing industry. But retailers should consider the long-term protection benefits of sharing these costs. Sophisticated criminals will continue to devise new schemes to undermine whatever payment system is in place. That makes common action in the future all the more important, as today’s fixes won’t fight tomorrow’s criminals. But bankers and retailers share a common priority in protecting their customers while offering the convenience of electronic payments—and so retailers should join us in fighting fraud. via Frank Keating: Banks Can’t Be the Only Backstop for Fraud – WSJ. When you become a banker, no one issues you a badge, nor are you fitted for a judicial robe. So why is the Justice Department telling bankers to behave like policemen and judges? Justice’s new probe, known as “Operation Choke Point,” is asking banks to identify customers who may be breaking the law or simply doing something government officials don’t like. Banks must then “choke off” those customers’ access to financial services, shutting down their accounts. Justice launched the effort in early 2013 as a policy initiative of the president’s Financial Fraud Enforcement Task Force, which includes the Federal Deposit Insurance Corp., the Consumer Financial Protection Bureau and other regulatory agencies. Though details are scant—much of the investigation has been conducted in secret—the probe aims to crack down on fraud in the payments system by focusing on banks that service online payday lenders and other services deemed suspicious by the government. Justice’s premise is simple: Fraudsters can’t operate without access to banking services, and so the agency is going after the infrastructure that questionable merchants use rather than the merchants themselves. Most of these merchants are legally licensed businesses on a government list of “risky profiles.” These include payday outfits and other short-term lenders. Bank regulators—particularly the FDIC—have joined in the action, warning banks away from serving more than 22 categories of businesses, including “Get Rich Products,” “Ammunition Sales,” “Pharmaceutical Sales,” “Home Based Charities,” and even “As Seen on TV” businesses. Some of these businesses may indeed be risky. But that doesn’t justify pre-emptively declaring them all criminals and freezing their access to the payments system. Operation Choke Point’s goal to fight financial fraud is admirable. But forcing banks to make judgments about criminal behavior and then holding them accountable for the possible wrongdoing of others is not a legal or effective way to do so. Banks contribute significantly to the law-enforcement mission and remain committed to helping agencies detect terrorist financing, money laundering and fraud. Justice shouldn’t turn that commitment against them. via Frank Keating: Justice Puts Banks in a Choke Hold – WSJ.